Fiorentinos villa consists of two separate buildings: a two bedroom main villa and and an open plan guesthouse right next to it. Both of them are available as one accommodation and can accommodate 2-8 guests. As you enter the main villa you can find the large living room and fully equipped kitchen along with the dining area and an office corner. One of the two bedrooms is also found in this area and offers two single beds that can be joined as one and one single sofa bed. Towards the back of the villa the master bedroom with the double bed as well as a bathroom with bathtub are located. The main entrance leads to a shaded veranda with dining table and a few steps take us at the private swimming pool. 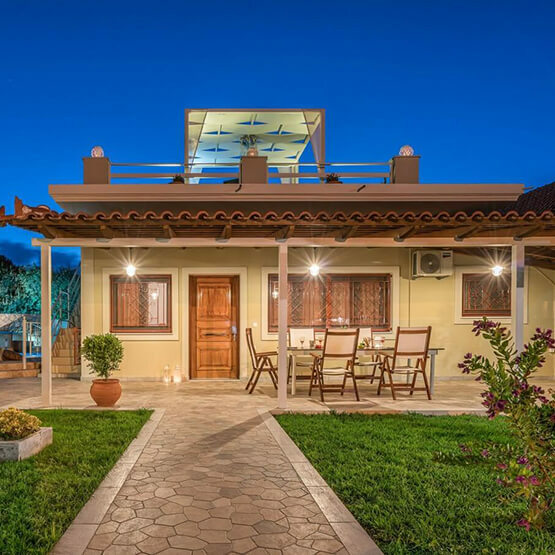 The main villa also offers an especially modified roof where sunbeds are situated as well as a table with chairs under a shaded tent and it is the best place for an evening drink or dinner. The guesthouse is right next to the main villa. It is a spacious open plan structure recently renovated that features a double and a single bed, kitchen with refrigerator, WC with shower, hairdryer, TV and air conditioning. Here you can find a second furnished shaded veranda with the couple of steps that lead you to the private pool.